Fire safety e-commerce business Fire Protection Online approached Blue Sheep to provide a foundation of accurate customer insight for a new direct marketing strategy, to stimulate new purchases from its existing customers and acquire new ones. The solution from Blue Sheep required analysing and segmenting its customer database using Money Map customer insight, to reveal profitable repeat buyers with a propensity to purchase again. 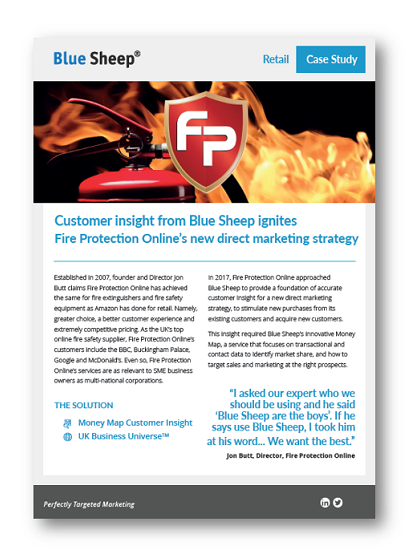 To find our how Blue Sheep supported Fire Protection Online and achieve an impressive direct marketing response rate in a challenging market, please fill out the form to download our case study.